"Rajapaksa could reinvent himself once again as a champion of pluralism and economic liberalism. With few other political options, that may be Sri Lanka’s best hope for the future. There is a hint of it in the President's dining room. Three years ago, he co-opted two former leaders of the LTTE, who fed intelligence to the army and helped bring the eastern provinces under its control. They had spent their whole lives fighting for the destruction of the Sri Lankan state but are now ministers in Rajapaksa's government, states the latest issue of TIME magazine (July 18) in an interview with President Mahinda Rajapaksa. The interview by Jyoti Thottam titled “Rajapaksa: The Hard Liner” also states: "Rajapaksa's political biography was crucial in maintaining support for the final military offensive against the Tigers. The LTTE pioneered suicide bombings, and a generation of Sri Lankans lived in fear of random attacks on buses and markets, and relentless political assassinations. Four Presidents before Rajapaksa had tried a combination of military action and negotiation against the Tigers; within a year of his presidency, he abandoned talks and bet everything on force." “Who is the man who tamed the Tigers? Above all, he represents Sri Lanka's Sinhalese Buddhist heartland in the rural south. His sarong and tunic are the spotless white of a devout Buddhist; his reddish brown scarf the color of korakan, a rough grain eaten as the staple diet of poor farmers. Everything about Rajapaksa — his big laugh, his rough-and-ready English, his bejeweled fingers and ink-black hair — marks him as part of the rural bourgeoisie, not the urban élite educated abroad. This is more than just an image. He was elected to Parliament as its youngest member in 1970 and moved slowly up through the ranks of his party while building a base of support in his home district of Hambantota,” the interview adds. Sri Lankan president Mahinda Rajapaksa sits at the head of a long banquet table, presiding over what looks like a hotel's lunch buffet. The mood is informal as Cabinet ministers, their clerks and assorted relatives and friends line up patiently to eat in the main dining room of Rajapaksa's official compound. Outside, on the streets of Colombo, he is the all-conquering hero. In May, Rajapaksa's government ended Sri Lanka's 26-year-long civil war against the separatist Liberation Tigers of Tamil Eelam (LTTE), and the capital's broad avenues are dominated by enormous banners glorifying him: "You are a divine gift to the country. May the gods bestow their blessings on you." But here, inside, Rajapaksa seems more like a down-to-earth family patriarch, nourished as much by the red rice, jackfruit curry and spicy fried fish as by the praise and demands of the supplicants who interrupt him. At one point, a young couple present him with a stack of betel leaves to be blessed. He chats casually with them; they show off their infant son. Rajapaksa faces questions about human-rights violations over the targeting of civilians in the final offensive, unexplained disappearances of Tamils and controls on the media. He must revive an economy that has been badly strained by military spending. Most importantly, he will have to restore to their homes and livelihoods some 300,000 Tamils in the north, a major chunk of the population of that region, who fled the fighting only to be detained in overcrowded internment camps. Without that crucial first step toward peace, Sri Lanka's alienated Tamils may never feel truly part of the nation. "If that does not happen, we are in a downward spiral in every way," says Vasudeva Nanayakkara, a Sri Lankan politician who has known Rajapaksa for more than 40 years as a friend and frequent ally in Parliament. "The way in which the state treats the victims of the conflict — that will be the basis on which national unity will be forged." In a rare interview with TIME on July 10, Rajapaksa made no apologies about how he prosecuted his war with the Tigers. "We showed that you can defeat terrorism," he said. The U.S. and Europe, his biggest trading partners, publicly criticized his apparent disregard for human rights, but he dismisses the West's objections. "Some people think we are still colonies," he said. "That mentality must go." Who is the man who tamed the Tigers? Above all, he represents Sri Lanka's Sinhalese Buddhist heartland in the rural south. His sarong and tunic are the spotless white of a devout Buddhist; his reddish brown scarf the color of korakan, a rough grain eaten as the staple diet of poor farmers. Everything about Rajapaksa — his big laugh, his rough-and-ready English, his bejeweled fingers and ink-black hair — marks him as part of the rural bourgeoisie, not the urban élite educated abroad. This is more than just an image. He was elected to Parliament as its youngest member in 1970 and moved slowly up through the ranks of his party while building a base of support in his home district of Hambantota. One minister in his government, who has known him since his early days in politics, says his desire to be President was obvious: "He was methodical." 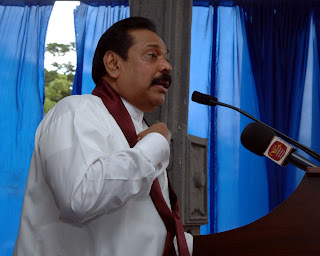 Rajapaksa's political biography was crucial in maintaining support for the final military offensive against the Tigers. The LTTE pioneered suicide bombings, and a generation of Sri Lankans lived in fear of random attacks on buses and markets, and relentless political assassinations. Four Presidents before Rajapaksa had tried a combination of military action and negotiation against the Tigers; within a year of his presidency, he abandoned talks and bet everything on force. He appealed to Sinhalese nationalism to recruit soldiers, promising them good salaries, pensions and respect. The cost was high. At least 6,200 troops were killed in the last three years of the war — more than the total U.S. military deaths so far in Iraq and Afghanistan. Yet Rajapaksa's popularity remains undiminished. In his victory speech to the nation on June 3, he spoke a few lines in Tamil as a gesture of reconciliation, but most of the oration was spent in praise of "our armed forces who astonished the world by their skill in war." He linked their effort to the nation's heroic past defending itself against invaders. "The lessons we learnt from those great battles of the past are ingrained in our flesh, blood and bones." When asked about the future of Tamils in Sri Lanka, Rajapaksa says all the right things: that Sri Lanka is one nation, which respects all peoples and faiths. Yet the strident Sinhalese nationalism, in Rajapaksa's party and in his more extreme allies, helped mobilize support for the war and influenced the way it was conducted. The U.N. issued several warnings — which Colombo ignored — about civilian casualties as the Sri Lankan army closed in on the Tigers, and estimates Tamil civilian deaths at 7,000. Nearly 300,000 Tamils from the northern war zone — including 45,000 children — have been detained in internment camps beginning in early 2008, without freedom to leave. In the face of pressure, Rajapaksa has hardened his position, interpreting criticism as a product of either LTTE propaganda or neocolonial sermonizing. He rejects the U.N.'s civilian-casualty figures and insists that conditions in the camps are good. But he has refused — even after declaring victory — to allow the press or international observers to verify those claims. No journalists or U.N. agencies have been permitted into the former war zone (with the exception of an entourage flying over it with U.N. Secretary-General Ban Ki-moon), and journalists are allowed into the camps only on government-sponsored tours. The U.N. and other international agencies — "58 of them!" Rajapaksa points out — do have some access to the camps, but they are not permitted to talk to the people inside to monitor their conditions. He insists that restrictions in the camps will be loosened eventually: "This is 1 1/2 months, my dear. Just give me some more time." Still, Rajapaksa's instincts are sharp, and he is well aware that resettlement from the camps will be a big issue in provincial elections in August and the next presidential election, which could be held as early as November. His reasoning for keeping northern Tamils in detention is constantly shifting. At various points in our interview, Rajapaksa says he is waiting until the screening of LTTE fighters is complete; until the north has better roads, electricity and water supply; or until the land mines are cleared. "As soon as we do that, we will send them," he says. But he will not commit to a timeline. He says he hopes that 60% would be resettled by the time of the presidential election. "It's not a promise, it's a target," he says. Rajapaksa has been similarly noncommittal about Sri Lanka's economy, particularly in the north, which has suffered not just war but two decades of neglect. Aside from an application for an IMF loan, Rajapaksa's only major economic initiatives are a $1 billion port in his hometown in the south and a $26 million loan scheme for small businesses in the north, both of which, critics say, may be politically popular but are unlikely to make an economic impact. That lack of conviction has angered Rajapaksa's opposition and deeply troubles Sri Lanka's peace activists, who worry that Tamils may face even worse repression and hardship than they did before the war. Their original concerns — for the protection of Tamil language and culture and self-governance in Tamil-majority areas — are not even on the agenda. Advocates for press freedom, too, are outraged that even after declaring victory, Rajapaksa has not lifted the restrictions on the press imposed as war measures. On July 12, the government banned a popular news website that had run stories critical of the government after the war's end, and it has not yet found those responsible for the murder in January of a prominent Sri Lankan journalist and critic of the government, Lasantha Wickrematunge, who was also a freelance reporter for TIME. But those who know Rajapaksa well say that his pragmatism may, in the end, win out. He never took a strong position on the LTTE until he ran for President, and he has supported privatization as President despite his long history as a left-leaning trade unionist. Most surprisingly, he was once a passionate advocate for human rights, speaking out against the government in the late 1980s during a notorious time of disappearances and killings. "Ideologically, he is not well formed," says Nanayakkara. However unlikely it may seem, Rajapaksa could reinvent himself once again as a champion of pluralism and economic liberalism. With few other political options, that may be Sri Lanka's best hope for the future. There is a hint of it in the President's dining room. Three years ago, he co-opted two former leaders of the LTTE, who fed intelligence to the army and helped bring the eastern provinces under its control. They had spent their whole lives fighting for the destruction of the Sri Lankan state but are now ministers in Rajapaksa's government. They stood in the buffet line with everyone else, and then quietly sat down to discuss the afternoon's committee meetings over lunch. The real world may be less civil and much more complicated, but at this table there is room for everyone.